If you work in a global marketplace, you will need to create multilingual content — and by that I mean content that is created in whatever native language your customers speak, not just English! Content is most effective when it leverages the full power of the language it is written in, including puns, local references, alliteration, etc. If you just speak to your global customers in their second language (in most cases English), you will fail to engage them with the words and phrases that have the most cultural and linguistic significance for them. Search engine optimization (SEO) is more important than ever, and creating content in a non-English language will help you rank in SERPs (search engine result pages) served in that language. This is especially true if your competitors aren’t creating multilingual content — and any edge you can gain in the world of SEO is one worth pursuing. But many marketers don’t see the value in creating multilingual content. 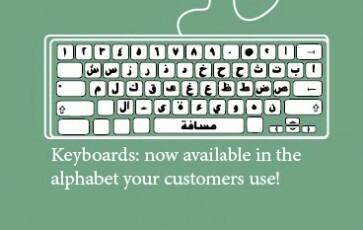 I work in the Middle East, and the vast majority of companies develop content solely in English, despite the vast and affluent Arabic-speaking population. Indeed, Arabic content constitutes just 2 percent of global digital content (as of 2013, per ESCWA) despite being the native tongue of 290 million plus people! That is an enormous market to leave untapped. Having a dedicated editor and writer who are native speakers of your target language is incredibly important for producing effective, quality content marketing. Not only will they be more familiar with the nuances of the language, but their work will likely benefit from being created in an environment where they can receive feedback from other team members who share their area of expertise. Ideally, your writer should not only speak the target language, but also the local dialect of the audience you want to engage with your content. For example, there is a great variance in the Arabic dialect spoken around the Gulf region; there are also significant differences between the Spanish that is spoken in Spain and what might be spoken in Ecuador, or Mexico. Of course, this isn’t always practical given budgetary pressures. I also recommend that you stay well away from translation services or software, as this tends to create stilted content that loses meaning (often with hilarious BuzzFeed-worthy results). 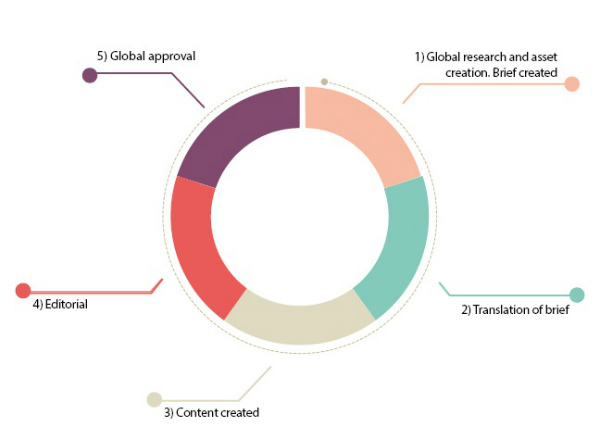 This process of multilingual content creation is laid out below, and it can be applied to copy, infographics, white papers, or any other form of content marketing. Additionally, the global lead should provide any data and media assets that need to be included in the work, such as statistics, links, pictures, logos, etc. Step 2: The native-speaking editor takes the brief and translates it into the target language before sending it along to the native-speaking content creator/writer. Step 3: The writer creates content based on the brief, and returns the copy to the editor for review. Step 4: The editor reviews the content against the brief to make sure all required points have been covered, and suggests changes and corrects minor/factual errors. The editor and the creator go back and forth until they are both satisfied with the final product. Step 5: Finally, the editor returns the brief to the global lead (who presumably cannot speak the native language) and confirms that all desired aspects have been completed accurately. The piece of content goes live, and is tracked and assessed based upon your company’s regular measurement practices. But wait… My budget can’t cover all this! The process sketched out above is an ideal, and you won’t be able to execute it in every instance, especially if you need to develop content in several different languages all at the same time. You may also need to adapt some steps to fit with your regular content marketing processes, which might involve additional tasks (e.g., creating an editorial calendar, conducting market research, tailoring content for delivery on certain platforms, etc.). For these reasons, I recommend you start your multilanguage program slowly, rolling out content in one new language at a time. This will give your team time to refine the process as you move forward, as well as an opportunity to demonstrate the success that will justify your continued efforts. If necessary, you can also streamline the process above by combining the roles of multilingual editor and writer. In this situation, your multilingual editor would receive the brief from the global lead, and would then create and self-edit the content without having to first translate the brief. However, while this may reduce your staffing costs, there are downsides to this model, as well — primarily that it eliminates the checks and balances of a team effort, and may result in mistakes slipping through the cracks. To combat this, you can periodically contract a second native speaker to edit, assess and score random, individual content pieces against the brief (think of it like an impromptu spot-check from the health inspector at your local café). This will keep your editors on their toes and also give them valuable feedback on their work. Some of the best content marketing happens when brands can leverage evolving news stories and trends in their content. You will want to do this in all your markets, sometimes with topics that are only relevant in one locality. This is a significant challenge, as the process outlined above works best with content that has been planned against an editorial calendar and has a bit of scheduling flexibility. My advice here is to only pursue “newsjacking” opportunities once you have multilingual editors who are confident and have a track record of good judgment. Then, you will need to provide them with a clear brief about what type of stories they can react to, and how to do so in a way that is appropriate for your brand. They can then be given leeway to create content on the spur of the moment — provided it aligns with their briefing. You should also consider asking your editors to run all content ideas by your global lead before publishing them — even if it’s just a late-night text to make sure they have sign-off. Investing in multilingual content is crucial. It will allow you to engage with customers and present them with a brand image that speaks to them in words they truly understand. The process defined above will require an investment, but if your business is serious about penetrating non-English-speaking markets, and serious about doing so with quality content marketing, it’s a sacrifice you won’t regret making. Ian Humphreys is a regional director for Caliber, an organic marketing agency with offices in London, Dubai and Edinburgh; he heads up Caliber's Dubai office. Ian has developed award-winning content marketing campaigns for some of the world's biggest brands including Ticketmaster, Tesco and TUI. He writes about the concepts and processes that lie behind effective content marketing. Contact Ian at ian.humphreys@caliberi.com or on LinkedIn.